Diary of La Crescenta, California, pioneer Benjamin Bennett Briggs, 1849. 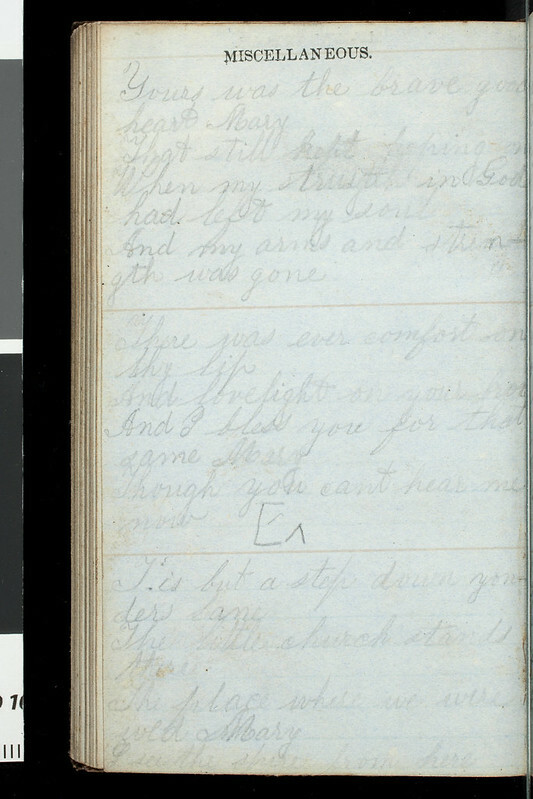 Diary kept by Benjamin Bennett Briggs during his travels from Sharon, Ohio to Yuba City, California from March through December of 1849. Briggs was accompanied by two of his brothers, John and George, as well as a neighbor, George Case. They set out with a wagon and a team of oxen, stopping in small towns or unsettled areas to camp. Briggs makes note of the weather and road conditions, food conditions, creek crossings, and health conditions of him and his companions. A major delay in their journey occurred near the end of July when Briggs was accidentally shot through the lung and was laid up for about a month while some of his party went on ahead. Briggs was "put into a wagon" through most of August but continued to travel and to record short notes in his diary. The last entry of the diary is for December 31, 1849, in which Briggs w rites, "Arrived at the Yuba pitched my tent there and [words erased]." Image published by Fæ on 2015-02-20 13:14:54 and used under Creative Commons license.